The Market Report Jackson Hole Real Estate Associates exclusively owns and maintains the valley’s oldest and most comprehensive database. Our Market Report, unlike others in the area, is derived from this proprietary, fortyyear old database (not just MLS data) and draws on our brokerage’s decades of success, making it the most trusted and accurate real estate report in the region. No other brokerage or agent has the resources available to offer this depth of expertise or insight into market conditions. The unmatched resources and knowledge of Jackson Hole Real Estate Associates – the largest and most dynamic real estate company in the region – combined with the largest independent affiliate networks, Christie’s International Real Estate and Leading Real Estate Companies of the World, allows us to offer the ideal balance of local expertise and global reach. As the region’s largest and most dynamic real estate company, Jackson Hole Real Estate Associates provides marketing and services that honor this remarkable destination. 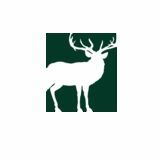 We are committed to being the leading luxury real estate brand in the Teton region. By staying on top of market trends and continually striving to offer cutting-edge marketing and advertising strategies we deliver extraordinary experiences that exceed our clients’ expectations. As a market leader in Jackson Hole, we believe the success of our company is based on the value that we provide for our clients, community and agents. It is this value-driven philosophy that has helped to guide the successful growth of our organization. There is no real estate company in the region that provides more exposure for listings or more choices for buyers. * The statistics used in this report are from the Teton Multiple Listing Service (MLS) and JHREA’s internal database. * This report does not go into detail on every segment of the market, but is intended to offer an overview of general market conditions. * All statistics are supplied by sources that have been deemed reliable but are not guaranteed. * Statistics are cumulative. 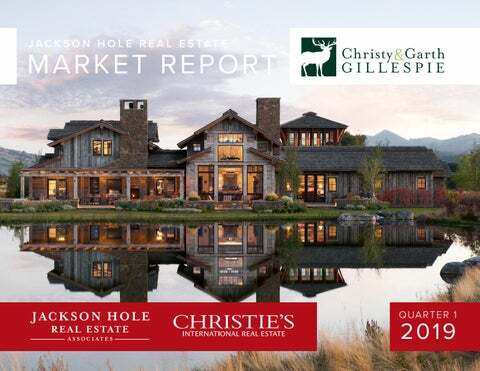 On behalf of our team of dedicated professionals at Jackson Hole Real Estate Associates, we are pleased to present our comprehensive Market Report for the First Quarter of 2019. In this detailed report, you will find information on the market segments making up the region. As the leading brokerage in Jackson Hole, we have developed a dynamic report that sheds fresh light on the trends that are shaping our real estate market. Please do not hesitate to contact Christy and Garth Gillespie for more information specific to your area. earlier, the average sale price increased 79%. consider each segment independently. Single-family homes made up the lionâ&#x20AC;&#x2122;s share of transactions, 44%, followed closely by condominiums and townhomes, which accounted for 40%. Overall, inventory dropped again, down 10% from the first quarter of 2018. Properties are also continuing to sell faster, with the average time on market down to 176 days. sales. In turn, the median sale price doubled compared to Q1 2018. The Aspens and Teton Pines areas experienced the largest increase in sales, up 300%. The number of active single-family home listings increased 27%. Homes sold about 13% slower than a year ago. this segment drove up the average sale price 47% compared to Q1 of 2018.
are selling about 28% faster than a year ago. and the properties are selling about 42% quicker than Q1 2018. Even with an 8% drop in active listings available, this segment of the market is not considered to have a shortage of inventory, and as the snow melts this segment is sure to see more activity. of these luxury sales. Residential properties accounted for 90% of luxury sales. The remaining 10% were vacant lots. Inventory of these high-dollar properties received a boost in the first quarter, up about 28% compared to the same time in 2018.